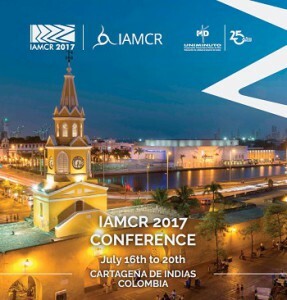 GRISS and Euromonitor researcher Òscar Coromina, Matilde Delgado, Rosa Franquet, Nuria Garcia, Josep Maria Martí, Belén Monclús, Emili Prado, Xavier Ribes, Celina Navarro, Gemma Gómez, Sheila Guerrero, Pau Lluís, Alba Mendoza and Elisa Paz have participated in the IAMCR 2017. The conference of the International Association for Media and Communication Research, titled “Transformación de la cultura, la política y la comunicación: Nuevos medios, territorios y discursos”, has the aim to generate and develop new theoretical approached that allow to think, discuss and create new concepts and methods of study in the communication field. Social Audience and European Serial Fiction. Nuria Garcia, Emili Prado, Belen Monclús and Alba Mendoza. Social television and information: Public and commercial strategies in Europe. Matilde Delgado, Celina Navarro, Pau Lluís and Elisa Paz. Audience participation in Spanish news programs between 2010 and 2016: Sobering up after the digital enthusiasm. Ignacio Bergillos (GRISS – UAB CESAG – UIB) and Rosa Franquet. Info-Show In European Television: The Industry Lab For Engagament With The Social Audience. Rosa Franquet, Òscar Coromina, Gemma Gómez and Sheila Guerrero. New content and production routines in the post radio era: The case study of “Yu: no te pierdas nada. Maria Gutiérrez, Belén Monclús, Xavier Ribes i Josep Maria Martí.